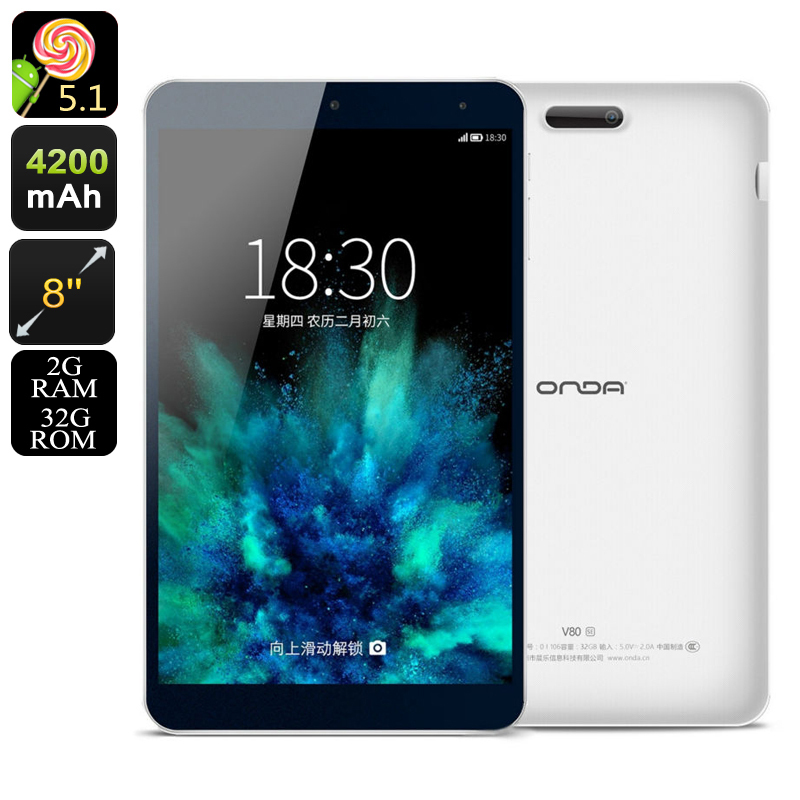 Successfully Added Onda V80 SE Android Tablet PC - Quad-Core CPU, 8-Inch IPS Display, Wi-Fi, 4200mAh, 128GB External Memory, 3D Game Support to your Shopping Cart. Take your mobile gaming and entertainment experience to the next level with the Onda V80 SE Tablet PC. This stylish Android tablet features a sleek and ultra-thin design, yet it packs some powerful hardware that allows you to enjoy the latest games, movies, and applications in stunning detail. Running on an Android operating system, this tablet PC holds all the trusted features that Android users are familiar with – guaranteeing to bring along a smooth and powerful user experience. With a sophisticated 4200mAh battery, this sleek tablet computer lets you watch Full-HD movies from beginning to end and enjoy numerous hours of online entertainment without you needing to worry about running out of juice. Packing all this power, this Android tablet will get you through the average day filled with mobile fun and entertainment without the need to recharge your device. Packing a powerful Quad-Core CPU that has been clocked at 1.33 GHz; this Onda tablet PC is capable of handling with demanding games, movies, and the latest mobile applications without dropping a frame. Added to that, this Android tablet also features a sophisticated 2GB of RAM, bringing along plenty of power to engage in multitasking sessions without slowing down your device. Whether you’re into gaming, movies, mobile applications, or simply like to browse the web and stay connected with friend and family online – the Onda V80 SE is sure to handle whatever you throw at it. Thanks to its highly portable design, this Android tablet computer can be carried along wherever you go. From now on you’ll never have to be bored again on your way to your next destination as, with this tablet at your side, you’ll always be able to enjoy your favorite media and games alike. To assure that you’ll experience nothing but the best media experience, this Android tablet packs a 7 Generation Intel HD Graphics Unit that supports high detail, vivid color, and stunning graphics. Along with its beautiful 8-Inch Full-HD display that portraits all media in 1920x1200 (WUXGA) resolution, you can be assured to enjoy all mobile media in breathtaking quality. By supporting up to 32GB internal memory and an absolutely stunning 258GB of external storage, you can be assured that this Android tablet always packs enough space for you to save all your favorite games, files, and media alike. Besides its beautiful 8-Inch FHD display and high-end graphic’s card, this Android tablet PC furthermore supports OTG thanks to which it allows you to attach external hardware devices such as a game controller or keyboard to your tablet – further increasing your mobile entertainment experience. Added to that, the Onda V80 SE also supports 3D gaming, letting you enjoy the latest online 3D games the mobile industry has to offer. For all mobile entertainment lovers out there that like to upgrade their gaming experience - this Onda tablet PC is certainly is an Android tablet to consider. The Onda V80 SE Tablet PC comes with a 12 months warranty, brought to you by the leader in electronic devices as well as wholesale electronic gadgets..
Arabic: - الكمبيوتر اللوحي الروبوت - Chinese Simplified: - 安卓平板电脑 - Czech: - Android Tablet počítač - Dutch: - Android Tablet PC - French: - Ordinateur tablette Android - German: - Android Tablet-PC - Hebrew: - מחשב לוח אנדרואיד - Hindi: - एंड्रॉयड टैबलेट कंप्यूटर - Hungarian: - Android tabletta számítógép - Italian: - Android Tablet Computer - Japanese: - Android のタブレット コンピューター - Korean: - 안 드 로이드 태블릿 컴퓨터 - Malay: - Komputer Android Tablet - Norwegian Bokmål: - Android tablett datamaskin - Romanian: - Android comprimat calculator - Russian: - Android планшетный компьютер - Spanish: - Android Tablet PC - Thai: - คอมพิวเตอร์แท็บเล็ต android - Turkish: - Android Tablet bilgisayar - Vietnamese: - Máy tính bảng Android.